Convection ovens work by circulating hot air rather than just producing radiant heat as ordinary ovens do. This saves energy by cooking food faster and at lower temperatures. 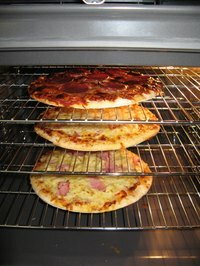 Converting a recipe for use in a conventional oven to cook with a convection oven and vice versa is not an exact science, but there are some basic guidelines you can follow. It's best to make a test run of different recipes to see which method is superior. Consider the recipe you wish to make. Convection ovens are better at browning and crisping food than conventional ovens; they will, for instance, create a thicker crust on bread. If the success of the recipe depends on the convection oven's crust-making abilities (or, conversely, if you normally make it in a conventional oven and it shouldn't have a crust), don't try to convert the recipe. Lower the oven temperature by 25 degrees Fahrenheit when converting a conventional oven recipe for convection oven. Or, if converting a convection cooking time to a conventional oven, raise the temperature by 25 degrees. Decrease the baking time by 25 percent for a convection oven (or, for a conventional oven, increase it by 1/3) as an alternative to changing the baking temperature. Decrease the temperature of the oven by 25 to 50 degrees for a convection oven (or increase it by the same amount for a conventional oven) when cooking recipes for covered dishes with a long cooking time. Test the food for doneness, regardless of your conversion method, about five to 10 minutes before the cooking time is up. Avoid opening the door of the convection oven more than this, since you can lose one degree of heat per second that the door is open. Place food in the center of a convection oven so that the air circulates evenly. Cooking too much food in a convection oven at once can raise the cooking time.